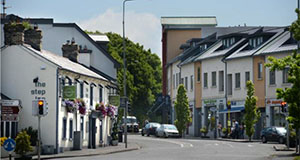 Stepaside and Aikens Village lie at the foothills of the Dublin Mountains, easily accessible from the M50 and Luas tram service, while only 7 miles from Dublin city centre. Neighbouring areas include Leopardstown, Sandyford & Belarmine. Our crèche is located in the heart of the neighbourhood; it has a very homely feel and there are boundless opportunities to learn through imaginative and creative play. We offer a broad curriculum underpinned by Aistear and Siolta frameworks encouraging children to learn through play to become active learners. We also have a wonderful arts and crafts room which our budding Picassos enjoy every day! All the rooms are on the ground floor and have easy access to our well laid out, secure outdoor play area, for the children to enjoy all year around. We have a strong connection with our neighbours and the wider community and parent partnership is very important to us. There is an open door policy at the centre and we host a number of parent and family events throughout the year. Today, Stepaside remains a beautiful urban village whilst also benefiting from a lively, thriving atmosphere where local businesses can profit from the increased population and the number of services & activities have further developed and grown in number. Its major natural resource, Three Rock Mountain has become widely known for activities such as hill running, forest walking, mountain biking & orienteering. Many locals & visitors alike come to the area to avail of these activities and some come simply to enjoy the extensive views taking in the sights from Clontarf, Dublin Bay, Dalkey, Dublin City, Bray Head & the Sugar Loaf. Stepaside is now home to many clubs such as, Stepaside Golf Club, Three Rock Orienteering Club, Three Rock Rovers Hockey Club & Paddocks Riding Club. Paddocks Riding Club is truly fabulous equestrian facility located just on the outskirts of Stepaside village. They are a family run riding centre with 45 stables, top of the range facilities, fully qualified staff offering lessons & events geared for both adults & children. Similarly, this club utilises & benefits from the natural & beautiful surroundings with outstanding views from the actual paddocks & trekking routes through the nearby wooded countryside. Golfing is synonymous with Stepaside and this small, urban area boasts both a golf practice centre and a prestigious par 3, 18 hole golf course. The Stepaside Golf Centre consists of a high spec floodlit covered driving range with 28 wide & spacious bays and 12 automated pop up tee bays enabling golfers to practice late at night throughout unpredictable weather. The par 3 golf course is a high quality, well maintained 18 hole golf course, complimented by stunning panoramic views. Giraffe Childcare is at the heart of the Stepaside community, providing exceptional childcare for local families for over 10 years.